It's the battle of the hybrids in Japan. The country's No. 2 automaker, Honda, is taking on leading Toyota Motor (TM) by introducing a hybrid version of its Fit subcompact to compete against the popular Prius. 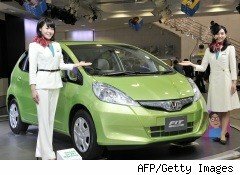 Honda Motor (HMC) officials unveiled the Fit hybrid in Tokyo on Friday. It has a starting price of 1.59 million yen ($19,160), cheaper than any other hybrid vehicle in Japan. Fit models with typical gasoline engines sell for about 1.2 million yen. Honda also sells another hybrid model, the Insight, which is sold in the U.S., for about 2 million yen, making it the second cheapest hybrid available in Japan. By comparison, the Prius sells for about 2.05 million yen. The Prius, one of Toyota's best-selling passenger cars in the U.S., has been Japan's most popular car since May 2009. Honda introduced the Fit hybrid just days after Japanese government subsidies designed to boost sales of greener cars ended in September. Honda has no plans to sell the hybrid version of the Fit in the U.S., but will begin selling it next year in Europe, where the model is marketed as the Jazz. The Fit hybrid combines a 1.3-liter gasoline engine and an electric motor, allowing it to achieve gas mileage of 30 kilometers per liter, according to Japanese calculation methods, Honda said. The hybrid's introduction by Honda officials coincided with the unveiling of a revamped version of the regular Fit, which has sold more than 3.5 million copies since its introduction in 2001, making it one of Honda's most popular models. In the U.S., the Fit is the subject of an investigation by federal regulators after the National Highway Traffic and Safety Administration received complaints about headlights that stopped working. The investigation involves about 133,000 Fit models from the 2007 and 2008 models years.